Time to bust some myths around Microsoft SQL Server. In the past, I have written about attaching data files to a SQL Server instance when log files are missing by the use of the FOR ATTACH_REBUILD_LOG clause of the CREATE DATABASE statement. Recently, I was referring the CREATE DATABASE documentation on MSDN. It’s a comprehensive document and and the following line for read-only databases caught my attention. For a read-only database, the log cannot be rebuilt because the primary file cannot be updated. Therefore, when you attach a read-only database with a log that is unavailable, you must provide the log files, or the files in the FOR ATTACH clause. This statement was contrary to what I had observed before. Hence, I decided to re-validate the findings via a demo. The first step, of course is to create a database. As can be seen from the script referenced above, the database we created as 2 data file groups, one is the default PRIMARY filegroup. Because we cannot make the PRIMARY filegroup READ_ONLY, we will be making the other filegroup (RODefault) READ_ONLY. To add complexity, we will also make it the default filegroup, i.e. any new objects created without specifying a filegroup, it will be created in the filegroup marked as default. Finally, we will also mark the database as READ_ONLY. Now, let us check out the database and filegroup properties. Now, let us detach the database, and delete the log file. (NOTE: We are removing the log file for the purposes of this demo only. Please do not do this in your QA or production environments). Finally, let us attach the database back to the SQL Server instance using the CREATE DATABASE…FOR ATTACH_REBUILD_LOG clause. File activation failure. The physical file name "C:\SQLData\MSSQL12.SQL2014\MSSQL\DATA\ReadOnlyDBForAttach_Log.ldf" may be incorrect. New log file 'C:\SQLData\MSSQL12.SQL2014\MSSQL\DATA\ReadOnlyDBForAttach_log.ldf' was created. As can be seen from the message above, the log file was successfully created and the database was successfully attached to the SQL Server instance. My findings above do not agree with the MSDN remark. At the moment, I am inclined to believe that this is a bug in the documentation as I have found a couple of years ago as well (see references). Please do share your views on the same in the post comments. This entry was posted in #SQLServer and tagged #SQLServer, #TSQL, Administration, DBA, Guidance, Myths, Tips on January 18, 2016 by nakulvachhrajani. In today’s world, mergers and acquisitions of organizations are a reality. Having been through a couple of M&As in the last couple of years myself, I have had a unique opportunity to experience changes which would not be experienced in the normal course of work. What happens to our SQL Servers that use windows authentication if the login name changes? The answer? Nothing. SQL Server continues to work as usual if the login name is the only thing that changed (and your applications do not use the physical “login name” in any way). Here’s a demo for clarity. 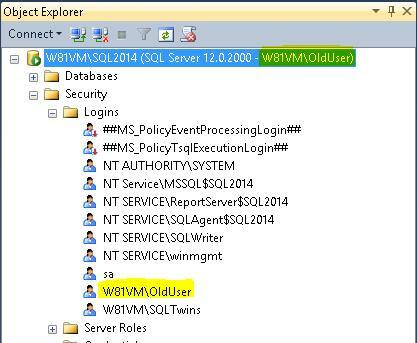 On my VM, I created a user “OldUser” and logged in to SSMS using Windows Authentication when running as that user. Now, because this is a local login, all I do is rename the Windows login using Computer Management. The same behaviour applies to logins renamed via Active Directory as well. I load the SSMS again – this time as “NewUser”. Notice how the authentication works even though the login name has changed. Windows authentication in SQL Server is based on the SID. Hence, even though the login name changed, SQL Server allowed me to login because the SID did not change. In fact, this is why when we create or modify a login, the only requirement is to ensure that the SID of the login is same as the one we want to create/modify. In a practical scenario, the IT teams would not re-generate the SIDs because that would mean too much work – realigning file & folder shares, resetting SSO and what have you. Instead, they simply update the login name (or the human interpretative part of the login). What this means is that the authentication on the SQL Servers continue to work as usual – even after the login changes. No manual intervention is required! Note of caution: Because the SQL Login name and the Windows login name are independent, renaming the Windows login will NOT rename the SQL login. The entry under sys.server_principals continues to read the old value. So, if your applications are designed to work based on the login name in sys.server_principals, you need to use ALTER LOGIN statements whenever IT changes the Windows login names. This entry was posted in #SQLServer and tagged #SQLServer, Administration, DBA, Guidance, Installation, Myths, Tips on January 4, 2016 by nakulvachhrajani.